Purpose: The objective of this study was to assess college students' behaviors, attitudes, and knowledge regarding hookah smoking. Methods: A convenience sample of 200 students from various majors, including allied health and nursing students, was used to conduct this study at a university located in the Midwestern United States. Respondents were asked about any past, current, and future hookah smoking behaviors. Likert-scale questions were used to assess attitudes regarding hookah smoking. Respondents were also asked ten questions regarding the history of and health effects of hookah smoking. A knowledge score was calculated based on the number of questions answered correctly. Survey data were analyzed using independent sample t-tests and a one-way ANOVA test at a significance level of p<0.05. Results: A total of 200 out of 204 surveys were returned, yielding an overall response rate of 98%. Sixty-eight percent of respondents reported having participated in hookah smoking, with time of first-time use ranging from 14 to 21 years of age. About one third of the respondents (32%) reported participating in hookah smoking in the previous 30 days. The majority (68%)of respondents estimated that they would not participate in hookah smoking in five years time. Over half of the respondents reported that it is socially acceptable to participate in hookah smoking and 43% reported that hookah smoking has relaxation benefits. The overall mean knowledge score regarding the health effects of hookah usage was 4.4 questions correct out of 10. There was a significant difference (p=.038) in the mean knowledge scores between hookah users (4.70) and non-users (3.81). When comparing the knowledge of allied health and nursing majors to all other majors, the allied health and nursing group scored significantly higher (p=.017) than the non-allied health and nursing majors, with mean scores of 4.80 and 3.81, respectively. Thirty-nine percent of the respondents were unaware that hookah tobacco and related smoke can cause oral cancer. Conclusion: Based on the high rates of college student use and the low knowledge scores, this study supports need for more education about hookah smoking and its health consequences. 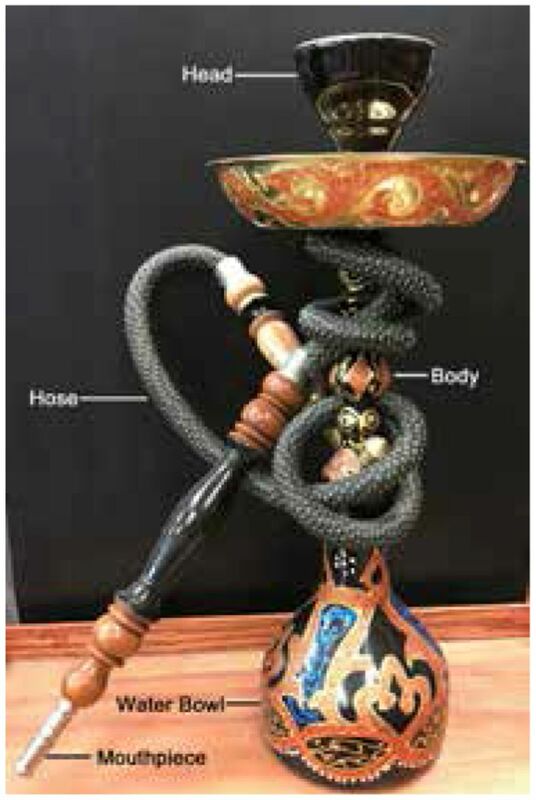 Studies have shown that hookah smoking contains 1.7 times higher concentration of metals, 6.5 times the amount of CO, and 46.4 times the amount of tar when compared to the equivalent nicotine dose found in cigarettes.7, 11 Because a hookah smoking session may last roughly 60 minutes, a hookah smoker may consume approximately 200 times more smoke during a hookah session as compared to a single cigarette.7, 12 In terms of inhalation of smoke volume, one 60-minute hookah session is considered the equivalent of smoking 60 to 100 cigarettes.18, 24 Additionally, the literature indicates that hookah use may serve as a gateway to other tobacco products such as cigarette smoking.3, 20 In light of these significant health risks, questions regarding hookah use should be part of the tobacco cessation and prevention conversations dental hygienists have with their patients on a regular basis. Despite increasing trends of hookah use and recognized oral health risks, little research has been published on hookah or waterpipe smoking in dental journals.24 The purpose of this study was to assess college students' behaviors, attitudes, and knowledge regarding hookah smoking and to examine the differences in knowledge between health care professional students and those in other disciplines as well as between those who engage in hookah smoking and those who do not. Institutional Review Board approval was obtained from the Minnesota State University (MSU), Mankato for this survey research study. The survey instrument consisted of questions about a student's past, current, and future hookah smoking behaviors. Likert-scale questions were also used to assess attitudes regarding hookah smoking. Knowledge regarding the history and health effects of hookah smoking was also assessed. A researcher-developed series of ten true/false questions based on current hookah research was created and the survey items were reviewed by several experts in the health field. The survey was pilot-tested on 20 individuals with the purpose of testing the survey items for understandability and the appropriateness of the instrument design. The pilot test results demonstrated that items were understandable and the response option “I don't know” was added to the knowledge portion to eliminate respondents from simply guessing. A convenience sample of MSU professors known to the primary investigator were emailed for permission to distribute the surveys during regularly scheduled class time. Professors from multiple disciplines agreed to allow the primary investigator to describe the study and distribute the surveys. Classes ranged in size from 15-30 students. The paper based paper surveys included the informed consent; students gave their implied consent by completing the anonymous survey, Only students enrolled at the university were invited to take the voluntary survey; there were no specific exclusion criteria. Surveys were distributed to a total of 204 students from various majors including allied health and nursing. Descriptive statistics, independent sample t-tests and a one way ANOVA test (p<0.05) were performed using SPSS version 21. Descriptive summary statistics were generated to describe behaviors of hookah users including: use and exposure over a lifetime and during the last 30 days; where and with whom users smoke hookah; smoking session length; self-predicted future hookah use. In this study, 68% (n=136) reported they have participated in hookah smoking, with a very minimum of one or two puffs in their lifetime. The average age of first use was 17.9 years, with a range of 14-21 years. This study found 83% of males and 61% of females had smoked hookah. Usage rate in Caucasian students (68%) was similar to non-Caucasian students (64%). Thirty-two percent of participants indicated that they have participated in hookah smoking in the last 30 days. Of those who participated in the last 30 days, 93% stated they smoked hookah between 1-5 times. Two respondents stated they smoked hookah 6-10 times in the last 30 days, and one respondent stated he/she smoked hookah 16-20 times in the last thirty days. Locales where hookah is smoked are described in Table III, with a friend's or acquaintance's home cited as the most common location (62%). In addition, 93% of students reported that they smoke with more than one friend in most instances. Few reported smoking with just one friend or with family members, and none reported smoking hookah alone. Reported lengths of hookah smoking sessions ranged from under 10 minutes to greater than 90 minutes. (Table IV) The most common reported smoking session length was 31-50 minutes (35%). While the majority of users (68%) believed they will no longer be smoking hookah in five years, 28% believed they will smoke less than once per month, and 4% believed they will smoke monthly. None of the respondents reported believing that they will be smoking hookah on a daily or weekly basis in five years. Responses regarding exposure to secondhand hookah smoke included: no exposure (37%), annually (16%), monthly (33%), weekly (13%), and daily (2%). In addition to hookah exposure and use, this study examined participants' familiarity, attitudes, beliefs, and knowledge regarding hookah. Seven percent of participants were not at all familiar, 74% were slightly-familiar to familiar, and 19% were very familiar with hookah smoking knowledge. The mean knowledge score for overall participants (N=200) was 4.4 questions correct out of 10; the “I don't know” response was calculated as an incorrect answer. Over half of participants (54%) stated hookah smoking is socially acceptable, with 21% reporting positive social benefits. Almost half of participants (43%) believed hookah smoking has relaxation benefits. Users perceive greater positive social benefits from hookah smoking (25%) than non-users (11%). As expected, more users believe hookah smoking is socially acceptable (68%) than non-users (22%). However, the majority of both users (67%) and non-users (69%) stated that hookah use is increasing in popularity. To examine the differences in knowledge regarding hookah smoking between allied health and nursing majors versus all other majors and the differences in users versus non-users, two independent sample t-tests were per-formed. Results indicated that allied health and nursing majors scored significantly higher than non-allied health and nursing majors(t(198)=2.41,p=0.02) and hookah users had significantly higher knowledge scores as compared to non-users. (t(199)=2.09,p=0.04) Knowledge scores among majors and users versus non-users are shown in Table VII. Results from this study suggest that hookah smoking continues to be a growing trend among college-aged students, with over half of the respondents (68%) reporting that they felt hookah smoking was gaining popularity. Approximately one third (32%) stated that they had participated in hookah smoking in the previous 30 days. In comparison, a 2008 national study of college students found that 10% of the students surveyed reported using hookah in the last 30 days.4 While a direct comparison between the two studies cannot be made due to variations in sampling and the regions (national versus Midwest) surveyed, it can be inferred that hookah use among college students is increasing. Previous studies indicate that hookah use is lower in the Midwest, the location of the university population surveyed in this study, when compared to other regions in the U.S.4, 5, 26, 27, 29 Griffiths and Ford found that 6% of Midwestern college students reporting hookah use within the past 30 days,2 however, 32% of respondents in this study reported smoking hookah in the last 30 days. In addition, this study takes place in a moderate-sized university town (population 40, 641), and despite the fact that there are no hookah bars within 100 miles, students are still participating in this form of tobacco use, with fewer than 6% reporting smoking hookah primarily in a hookah café or bar. (Table III) Results from this study suggest that the increased hookah use is not limited to larger cities where hookah cafés or bars are more common. Hookah smoking is common in social gatherings; 93% of the respondents stated that they were using hookah in the presence of more than one friend. Peer influence is also suggested to play a role in hookah use,26 and results from this study indicate that students are smoking in residences, and size of the town or proximity to hookah bars may not be a critical factor. Students in this study claimed to be familiar with the risks of hookah smoking but the majority of the respondents answered fewer than half of the questions (average score 4.4 out of 10) correctly indicating limited knowledge on the overall impact of hookah smoking on general and oral health. Allied health and nursing majors had higher scores (4.80) on the knowledge-based questions as compared to students with non-allied health and nursing majors (3.81). This may be due to the fact that allied health and nursing students have had more exposure to health-related courses in disease prevention as compared to students from other majors. However, even the allied health and nursing students answered less than half the questions correctly, which may indicate that they have not learned specifically about hookah usage in their programs. In addition, hookah users scored higher (4.70) than non-users (3.81) on the knowledge based questions. Nevertheless, they also answered less than half the questions correctly. Further studies could investigate the reasons why hookah users continue to smoke despite the known harmful effects of hookah use. Overall, the research indicates a need for education on the ill effects of hookah use across all demographics. The very nature of hookah smoking process may be the reason students believe it is less harmful than cigarettes: roughly half of the respondents incorrectly indicated the belief that water filtered out the harmful ingredients, and half incorrectly believed that hookah smoking was less harmful because the tobacco is sweetened. Half of respondents also thought there was less smoke inhalation involved with hookah use, while in fact a person actually inhales 200 times the amount of smoke during a hookah session as compared to smoking a cigarette.7, 12 In general, long-term tobacco use has been linked to cardiovascular disease; however, in this study, nearly half (46%) of the hookah users were not aware of this risk. In comparison to other knowledge questions, respondents had the highest awareness (60%) that hookah smoking caused oral cancer. Another concern was that while most students reported smoking hookah in a group, only 44% of the respondents believed that secondhand smoke from hookah is considered a health risk. Not understanding the dangers of first and secondhand hookah smoke may also indicate that hookah users may not realize their increased risks for cancer, cardiovascular, respiratory and infectious diseases. Respondents in this study reported first-time hookah use occurred between 14-21 years of age, (17.9 years average) thus indicating the need for hookah usage to be included in tobacco education programs beginning in middle school and continuing through high school. Additionally, hookah smoking education should be incorporated into the dental and dental hygiene curricula, as well as inclusion in continuing education programs for all related health professions. Dental professionals are encouraged to participate in community health fairs, school education, and in public policy sessions promoting legislation restricting hookah smoking.30 Future research should be conducted to assess dental hygienists' knowledge regarding hookah smoking as well as their ability and willingness to provide education on this important health issue. There are a few noteworthy limitations to this study. This was a small convenience sample from a Midwest university and may not be generalizable to all college students across the U.S. The primary investigator recruited the participating professors and students, administered the survey and collected the data forms. Future studies should use an assistant or neutral party to conduct these aspects of the study. In addition, the survey knowledge questions and scoring were designed by the authors and were not validated. Tobacco is the leading cause of preventable death worldwide and is related to 5 million deaths annually. While significant research has been conducted regarding the harmful effects of cigarette usage, hookah smoking has generated little study. Results from this study indicate that hookah usage is increasing in popularity among college students. Furthermore, this study indicates a significant knowledge gap regarding the health effects of hookah smoking across all demographics of college majors, including allied health and nursing. This knowledge gap supports the critical need for incorporating the harmful effects of hookah smoking into the curricula of future health care professionals, especially dental hygienists. Incorporating information on the detrimental health effects of hookah use is links well with the overall tobacco education provided by dental hygienists on a regular basis, with the goal of educating future generations of students to the harmful effects of tobacco use regardless of the delivery. Trisha M. Krenik-Matejcek, RDH, MS is an assistant professor; Angela L. Monson, RDH, PhD is a professor; Brigette R. Cooper, RDH, MS is a professor; all in the Department of Dental Hygiene, Minnesota State University, Mankato, MN. This manuscript supports the NDHRA priority area Client level: Oral health care (health promotion: treatments, behaviors, products).
. Tobacco smoking using a waterpipe: a re-emerging strain in a global epidemic. Tob Control. 2004 Dec;13(4):327–33.
. Hookah smoking: behaviors and beliefs among young consumers in the United States. Soc Work Public Health. 2014;29(1):17–26.
. Subjective well-being and hookah use among adults in the United States: a nationally-representative sample. Drug Alcohol Depend. 2015 Aug;153:242–9.
. Hookah use among U.S. college students: results from the national college health assessment II. Nicotine Tob Res. 2012 Oct;14(10):1145–53.
. Knowledge and attitudes toward hookah usage among university students. J Am Coll Health. 2013;61(6):362–70.
. Hookah smoking-A growing threat to public health [Internet]. Chicago (IL): American Lung Association; 2013 [cited 2016 May 26]. 7p. Available from: http://www.lung.org/assets/documents/tobacco/hookah-policy-brief-updated.pdf.
. Harmful effects of shisha: literature review. Int Arch Med. 2014 Apr;7:16.
. Oral cancer facts [Internet]. Newport Beach (CA): Oral Cancer Foundation; 2017 [cited 2017 April 12]. Available from: http://oralcancerfoundation.org/facts/.
. A dental hygienist's role in tobacco cessation. Int J Dent Hygiene. 2003 May;1(2):105–9.
. Hookah myths and truths [Internet]. College Park (MD): University of Maryland Health Center; 2007 [cited 2016 May 26]. Available from: http://www.health.umd.edu/sites/default/files/Hookah%20Brochure-%20Final_0.pdf.
. Waterpipe tobacco smoking and cigarette smoking: a direct comparison of toxicant exposure and subjective effects. Nicotine Tob Res. 2010 Jun;13(2):78–87.
. Hookahs [Internet]. Atlanta (GA): Centers for Disease Control and Prevention; 2016 [cited 2016 May 26]. Available from: http://www.cdc.gov/tobacco/data_statistics/fact_sheets/tobacco_industry/hookahs/.
. Waterpipe tobacco smoking: knowledge, attitudes, beliefs, and behavior in two U.S. samples. Nicotine Tob Res. 2008 Feb;10(2):393–8.
. Toward understanding the health effects of waterpipe or ‘hookah’ smoking [Internet]. Washington (DC): American Chemical Society; 2013 [cited 2016 May 26]. Available from: http://www.acs.org/content/acs/en/pressroom/newsreleases/2013/september/toward-understanding-the-health-effects-of-waterpipe-or-hookah-smoking.html.
. What are young adults smoking in their hookahs? A latent class analysis of substances smoked. Addict Behav. 2014 Jul;39(7):1191–6.
. Narghile Smoking and its adverse health consequences: a literature review. Br Dent J. 2009 Jun;206(11):571–3.
. Systematic review and meta-analysis of inhaled toxicants from waterpipe and cigarette smoking. Public Health Rep. 2016 Jan-Feb; 131: 76-85.
. Tobacco smoking using a waterpipe (hookah): what you need to know. AANA J. 2013 Aug;81(4):308–13.
. Exemptions for hookah bars in clean indoor air legislation: a public health concern. Public Health Nurs. 2010 Jan-Feb;27(1):49–53.
. Waterpipe use and susceptibility to cigarette smoking among never-smoking youth. Am J Prev Med. 2015 Oct;49(4):502–11.
. Fast facts [Internet]. Atlanta (GA): Centers for Disease Control and Prevention; 2015 [cited 2016 May 26]. Available from: http://www.cdc.gov/tobacco/data_statistics/fact_sheets/fast_facts/index.htm.
. Tobacco policy trend alert. An emerging deadly trend: waterpipe tobacco use [Internet]. Chicago (IL): American Lung Association; 2007 [cited 2016 May 27]. 9 p. Available from: http://www.lung.org/assets/documents/tobacco/2007-tobacco-policy-trend.pdf.
. Hookah, is it really harmless? Respir Med. 2014 May;108(5):661–7.
. Association between tobacco waterpipe smoking and head and neck conditions. J Am Dent Assoc. 2015 Oct;146(10):760–6.
. Opportunities for policy interventions to reduce youth hookah smoking in the United States. Prev Chronic Dis. 2012;9:E165.
. Hookah use among college students from a midwest university. J Community Health. 2011Apr;37(2):294–8.
. Evidence of emerging hookah use among university students: a cross-sectional comparison between hookah and cigarette use. BMC Public Health. 2013 Apr;13:302.
. Waterpipe smoking among college students in the United States: a review of the literature. J Am Coll Health. 2012;60(3):244–9.
. Hookah use among college students: prevalence, drug use, and mental health. Drug Alcohol Depend. 2014 Aug;14:16–20.
. Tobacco education in dentistry and dental hygiene. Drug Alcohol Rev. 2009 Sep;28(5):517-32.